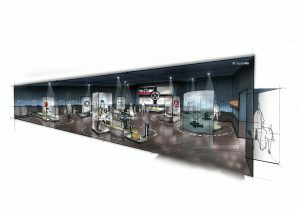 Over £1 million in funding has been awarded by The Heritage Lottery Fund towards the renovation of Scapa Flow Visitor Centre and Museum. Plans for the project include an extension to the visitor centre, as shown above. A Heritage Lottery grant of up to £1.155 million has been approved for a major renovation of the Scapa Flow Visitor Centre and Museum in Lyness, Hoy, Orkney Islands Council have confirmed. The project, which is due to start next spring, will involve the restoration of the historic wartime buildings. There are also plans for enhancement of interpretation and displays and the creation of a new building to house an exhibition space, café, toilet facilities, and information areas. The Heritage Lottery Fund support completes a major funding package made up of grants from Historic Environment Scotland, Highlands and Islands Enterprise, the Council’s LEADER fund and Capital Projects programme. The museum is set to re-open in time for the commemoration marking 100 years since the scuttling of the German High Seas Fleet in Scapa Flow in 1919. Councillor Rob Crichton, chair of the OIC Education, Leisure and Housing Committee is pleased to see the project get the necessary funding. “Attracting such a high level of external funding to this project is a real success story for one of our most fragile island communities,” he said.